Hi everyone! 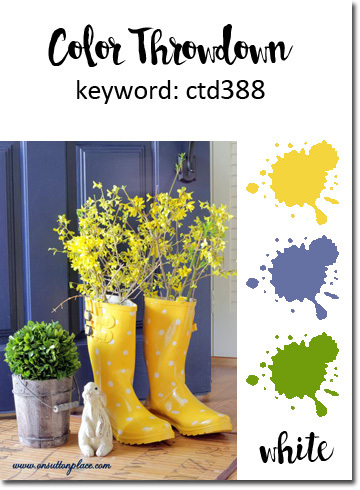 I'm happy to say I'm the hostess this week for the Color Throwdown Challenge and I'm hoping you will love this color palette - golden yellow, navy and white - as much as I do! I was inspired by these wedding cakes and thought the colors could be used for SOOO many different card themes! Initially, I was going to go with a a classy wedding card, but those cascades of flowers drew me in a different direction in the end! I adhered the striped patterned paper from Echo Park's Splendid Sunshine pad, then raised a white CS panel with foam tape. I loosely adhered navy and vellum die cut leaves (large and small Mariana Vine dies by Poppystamps) then added layered die cut posies by Lil' Inker Designs. 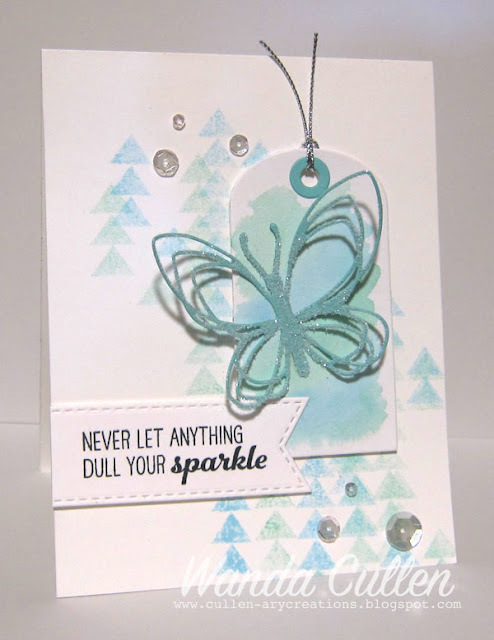 The layered sentiment and tag are dies by Reverse Confetti. I rounded a couple of the card corners using the 1/4" corner chomper setting. 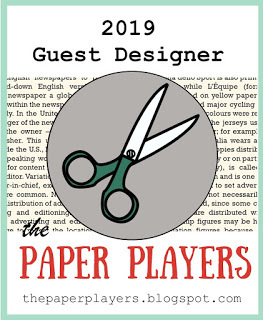 Be sure to visit our guest star stamper - Linda Beeson from the Paper Cutting Kind of Day blog! 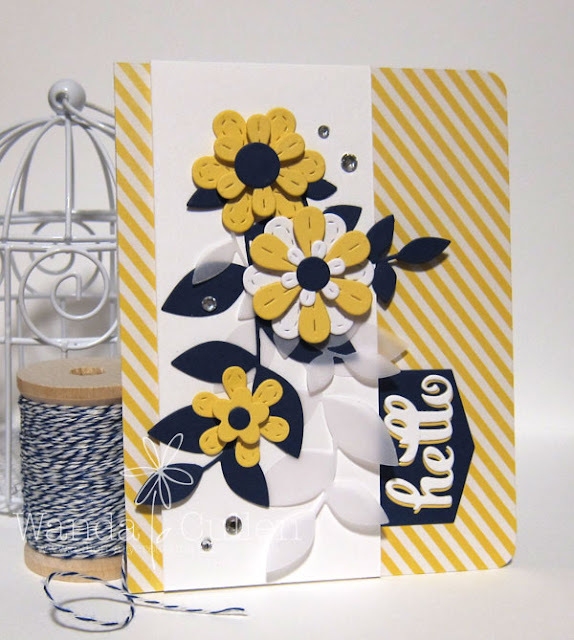 Sadly, we say goodbye to Amy Rohl who has been an awesome inspiration as our guest designer this month! 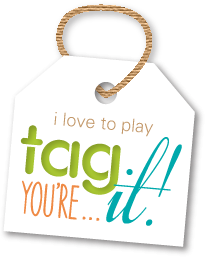 Stay tuned next week when we announce our new May guestie. 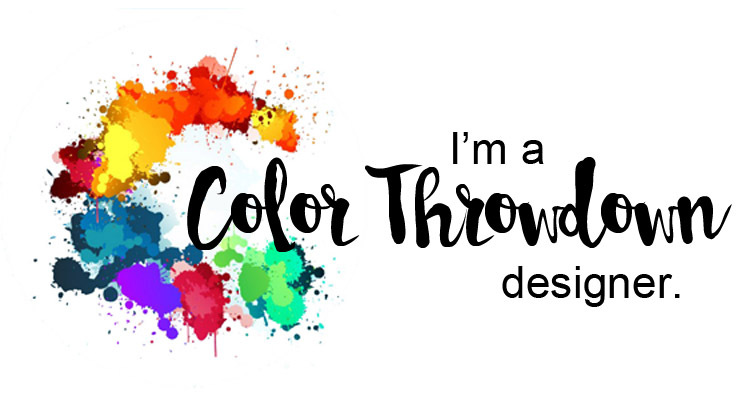 To get all the details on how to play along, please go to the Color Throwdown blog and check out the info on the right sidebar! 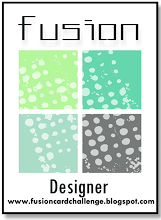 You can also check out the rest of the design teams' creations for more inspiration on the CTD blog or you can clink on their blog links below. I was inspired to create this card by Vicki's great color palette for the SCS Color Challenge to use Daffodil Delight, Island Indigo and Garden Green. 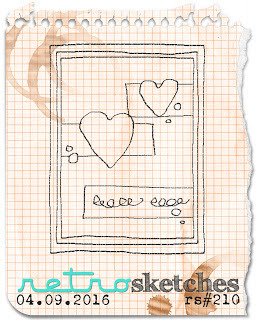 I needed a sketch inspiration, so my next stop was at CAS(E) This Sketch. Because I'm needing a ton of birthday cards this spring, I'm also joining in the Seize the Birthday Challenge where anything goes this week! 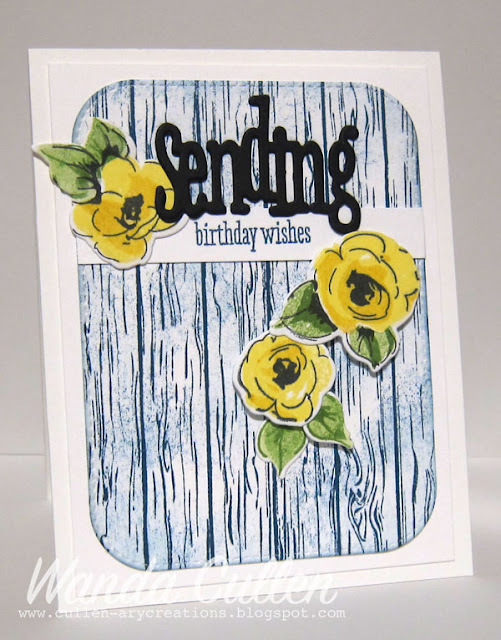 I started by stamping the woodgrain BG by Altenew in Island Indigo ink. I die cut it with MFT's Stitched Rounded Rectangle STAX Die-Namics and added some light sponging. 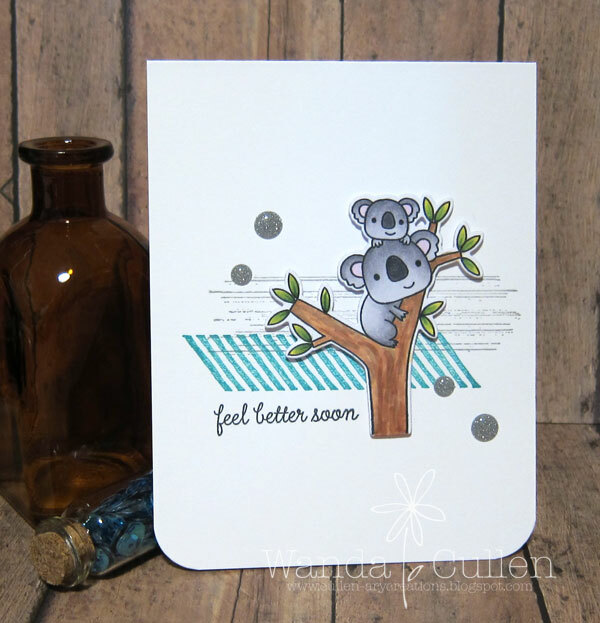 The sentiment is a new die and stamp set called Sending, Hoping, Wishing by WPlus9. The flowers are from Altenew's Painted Flowers stamp set with matching dies. Whoa!! April has whizzed on by and we're already on the last Monday of the month and you know what that means?! A different shaped card - circle or square - is required! No A2s for this Mojo Monday Challenge. I went with a 5" square card base and planned ahead for a baby shower that will be happening soon at work. I decided to place the sentiment - from Verve's To the Moon set - in the back of a shaker frame. I love this patterned paper from Echo Park's Bundle of Joy pad and let the paper do most of the work. I stamped 3 stars from Verve's Seeing Stars set, then punched the large one (SU) and fussy cut the two smaller ones. I used Early Espresso CS for the frame and the same color ink for the sentiment and stars. Wink of Stella clear shimmer brush pen was used over the solid blue star. 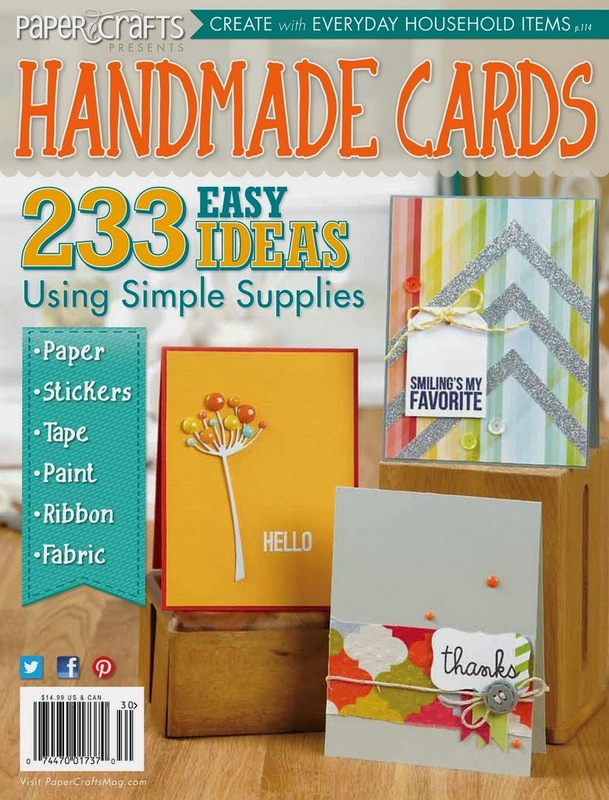 The rick rack border was created using Die-Namics from MFT. The beaded assortment is by The Ton. For more inspiration from the rest of the mojomakers, click on their blog links below...or...you can go to the Mojo Monday blog and click on the first eight thumbnails. 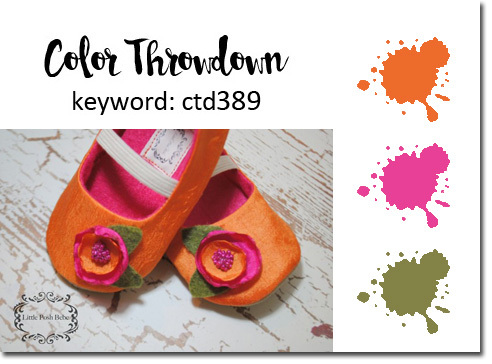 Vickie has chosen one of my favorite spring/summer color combos for this week's Color Throwdown Challenge...inspired by these fun shoes! Don't you just love them?! 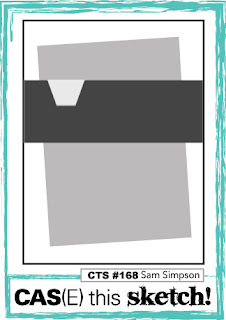 I had happy mail from Simon Says Stamp on Saturday, so it was a no brainer as to what I would use on my card. 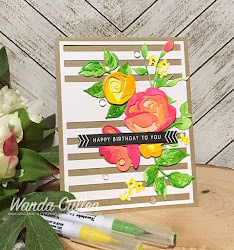 Dawn Woleslagle - owner of WPlus9 stamps - posted a recent video HERE - and as you can see, I shamelessly CASEed her cards in the video by adding a loose watercolor background with distress inks: Picked Raspberry, Spiced Marmalade, Twisted Citron and Evergreen Bough. I used a Reverse Confetti banner die and white embossed a couple of Verve butterflies then fussy cut and adhered with clear Kool Tak Foam (it raises the image to give it dimension but it doesn't show through the vellum). 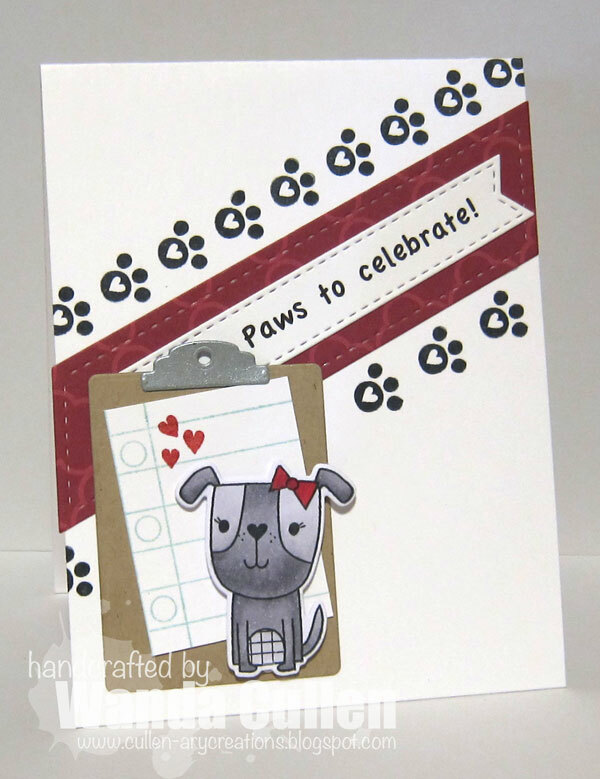 I stamped the sentiment twice using my MISTI. I die cut two of the 'sending' sentiment to give it more dimension. STAMPS: Sending, Hoping, Wishing (WPlus9), Chicks Rule (Verve)-large butterfly and Eggstra Special (Verve)-small butterfly. DIES: Outlined Roses (WPlus9), Sending, Hoping, Wishing (WPlus9), Beautiful Banners (Reverse Confetti). 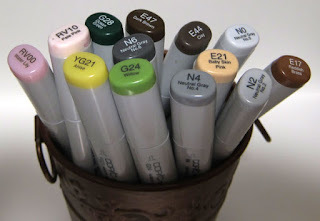 Be sure to visit our guest star stamper - Jerrie Mead - at her Coloring Outside the Linez blog! I was so inspired by her profile description! Congrats, Jerrie! fave by Concord and 9th: Floral and Flutter Dies. I cut it from SU's Pool Party CS than added Martha Stewart's crystal fine glitter. 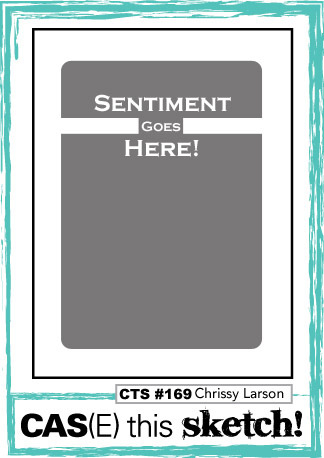 The sentiment banner is MFT's Stitched Fishtail Flags STAX Die-Namics with the sentiment stamp from WPlus9's Sparkle and Shine set. That's it from me for now...Heading to the shower then off to work! I'm enjoying this glorious spring weather we're having in VA! It's Monday and that means a new week and a new Mojo Monday Challenge! I was having a mental block with ideas, so off to the Pinterest website I went for some inspiration. 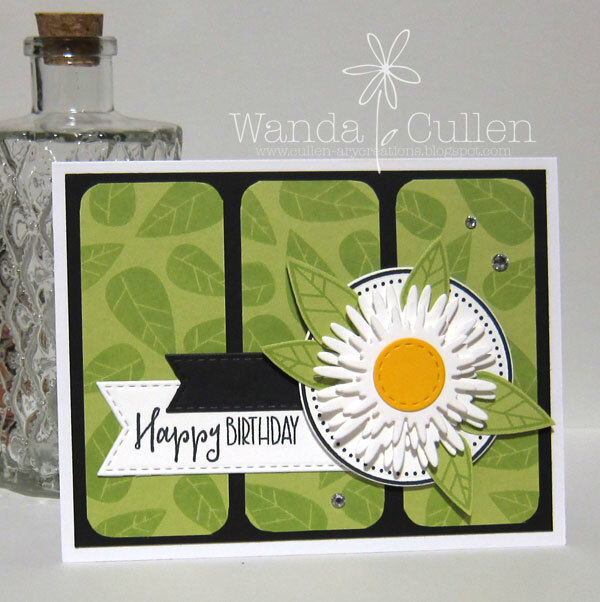 As soon as I saw Lisa Addesa's card HERE, I knew I wanted to CASE her colors and tone on tone leaf stamping. I started with my favorite green cardstock - Sour Apple by My Favorite Things - and cut 3 panels that were 1 1/2" x 3 3/4". 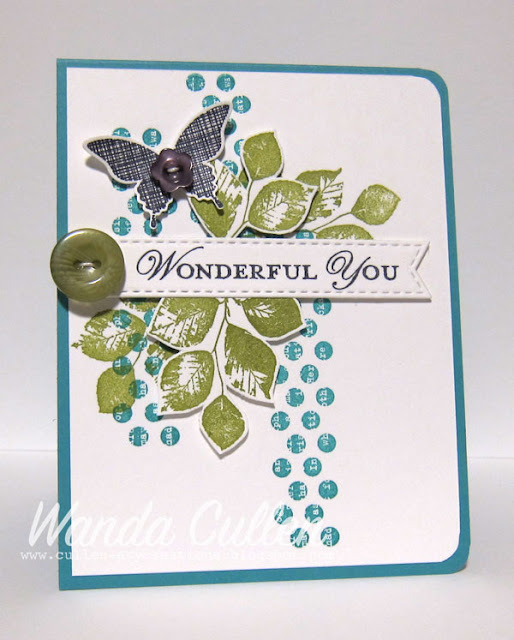 I then stamped leaves from Verve's retired Autumn Splendor set using Beanstalk ink by WPlus9. I rounded the corners using a corner chomper. 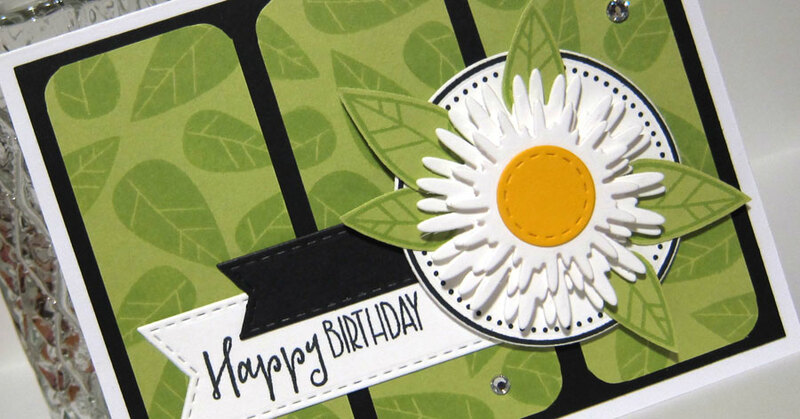 The circle frame is another retired stamp from Verve's Just For You set (I promise you the rest of the Verve goodies are NOT retired :-) I layered up 2 large and 1 small Simply Daisies dies (Verve) using foam tape between the layers. The sentiment is from the newly released Simply Amazing set (Verve). ...and celebrate we will! Dining out at a favorite local restaurant tonight is the way our family will celebrate 3 April birthdays! My daughter's birthday is actually today and since she's a huge dog lover, I knew right away I wanted to use Reverse Confetti's adorable Puppy Love stamp set to create her card. 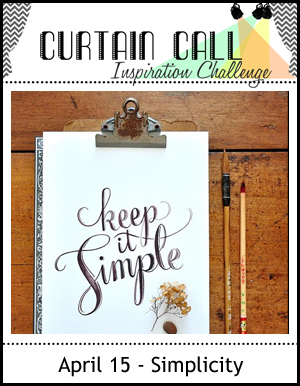 I started with inspiration from Stacey's Simplicity theme for the new Curtain Call Inspiration Challenge. 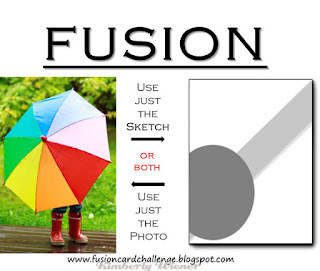 I'm also using the sketch for the current Fusion Challenge. The notebook page stamp is from RC's Class Act set. The clipboard and dog dies are also by Reverse Confetti. Coloring was done with Copics: N0, N2, N4, R29, R37. 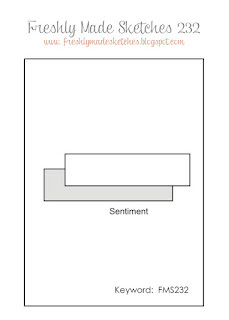 The sentiment was computer generated. The best part of this card just might be the inside. 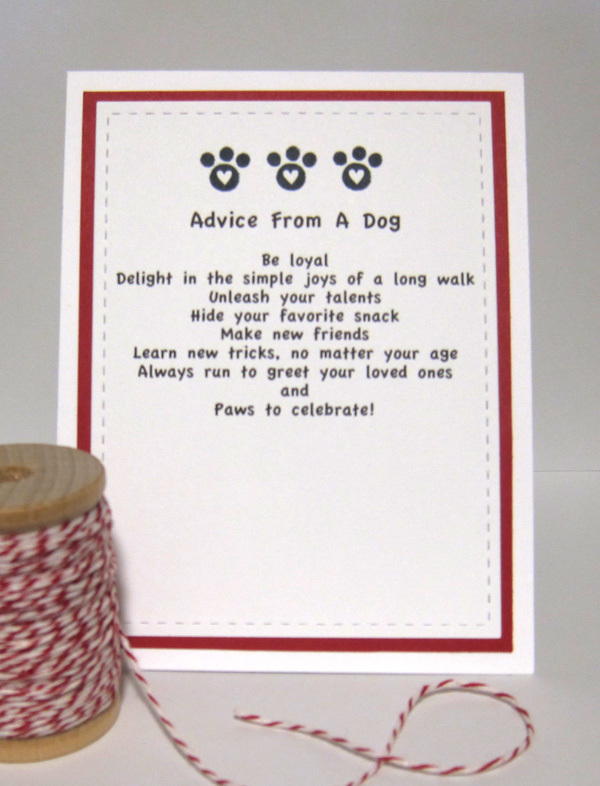 Loved this advice from a dog that I saw on a store bought card! TGIF and a 3 day w/e off work! Happy day to all! I added a watercolor wash BG to the tilted, stitched rectangle using Tumbled Glass distress ink. I had this striped paper on my desk from a previous project, so included it in the border. 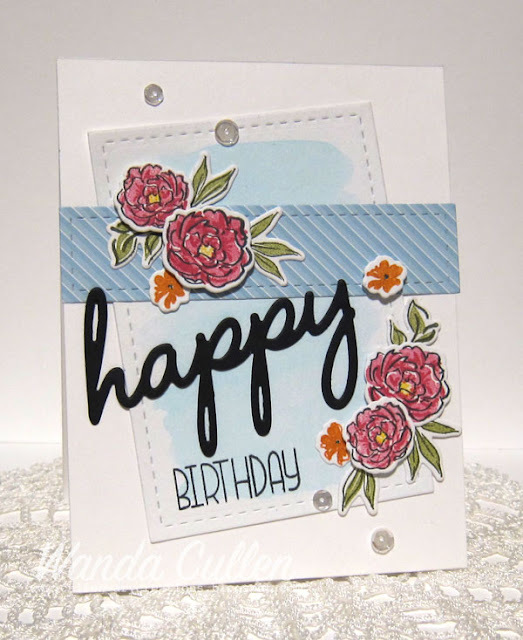 STAMPS: Pretty Little Peonies and Whole Lotta Happy by WPlus9. 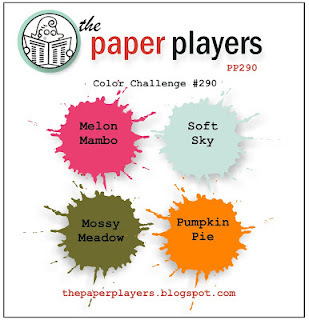 INK: Melon Mambo, Pumpkin Pie, Old Olive, Always Artichoke. DIES: Happy Trio and Pretty Little Peonies by WPlus9. 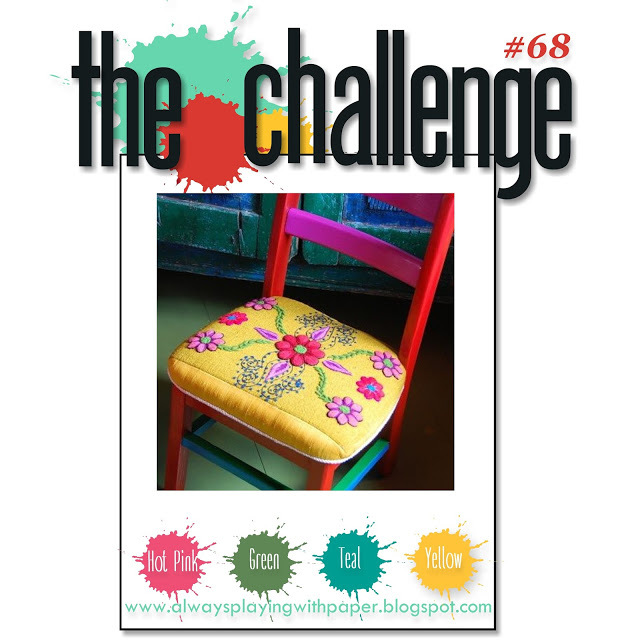 Sabrina has a fun Ways to Use It Challenge on SCS - be inspired by ads! 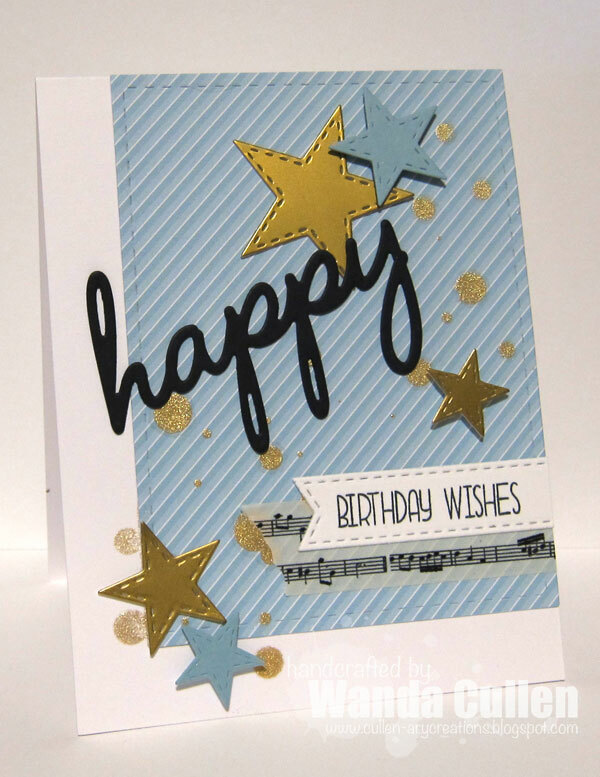 I needed a birthday card for my son and I kept hearing the Disney commercial theme song in my brain "When you wish upon a star...makes no difference who you are". 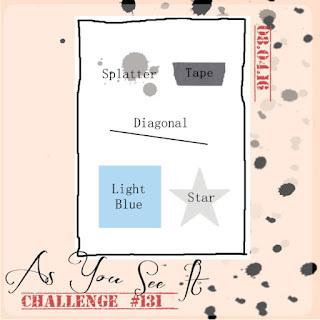 It fit right in with the current As You See It Challenge #131 where they're asking us to use splatter, tape, diagonal, light blue and star elements. Edited to add: I missed the deadline. :-( And as they say...the rest is history and my son's birthday card was completed! 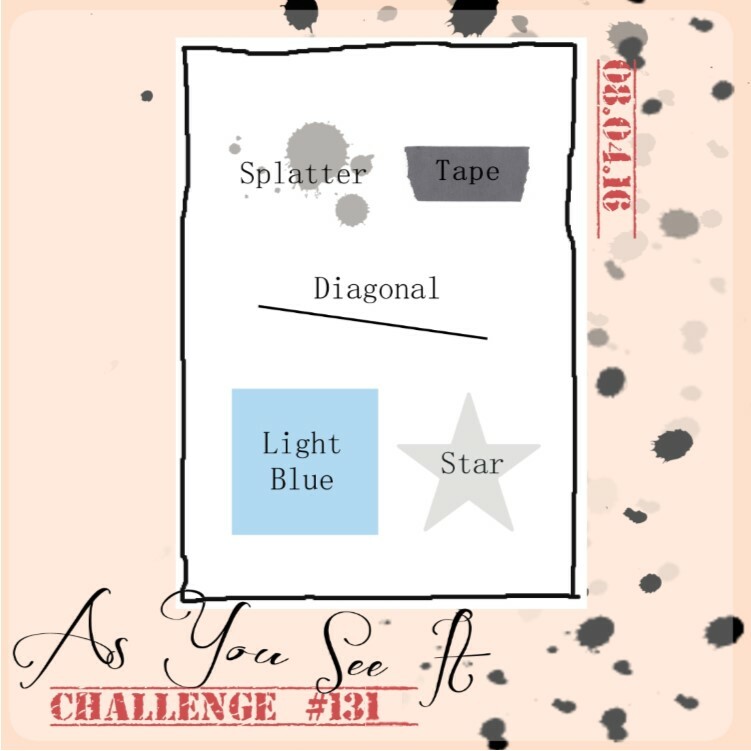 After choosing the diagonal striped DP (from Doodlebug Design's Sugar Shoppe pad), I then splattered Heidi Swapp's Color Shine in gold. 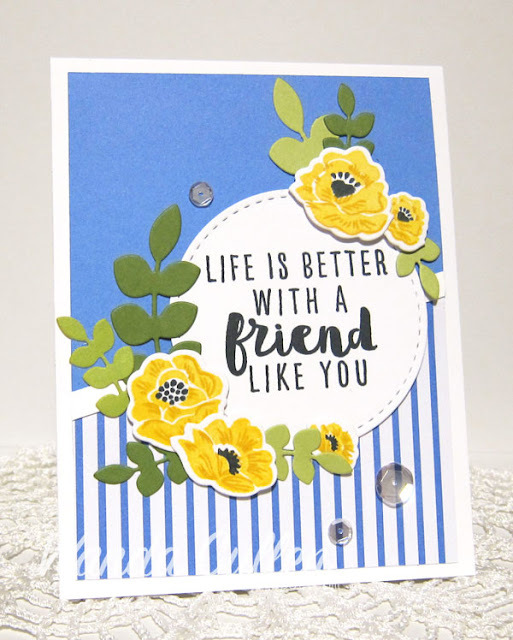 The sentiment die and stamp is from WPlus9's Whole Lotta Happy set. Stitched stars and rectangle are by Lil' Inker Designs and Stitched Fishtail Flags STAX Die-Namics die for the sentiment banner is by MFT. Thanks for stopping by...I always enjoy hearing your comments! Gorgeous Grunge stamp set. The bear duo from RC's Bear Hugs set - just released April 8th - was stamped with Memento Tuxedo Black ink on X-Press It Blending Card paper then colored with Copics and die cut by a matching Confetti Cuts die. Thanks for stopping by...heading out to work soon. 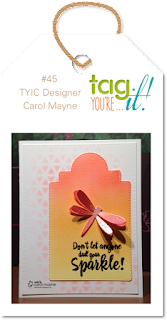 It's time for another Color Throwdown Challenge and Lynn has a wonderful color combo that is so perfect for spring/summer creations! I just love those fun rain boots being used as vases! I'm also playing along with the April sketch for the current Sketch For You To Try Challenge on the Reverse Confetti blog. 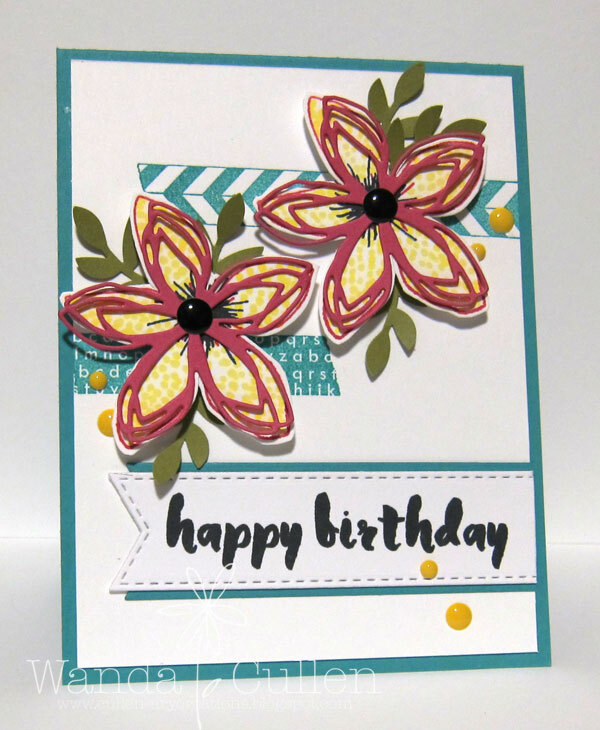 Using papers from Recollections' Craft It Flora pad for the background, I layered up flowers from Reverse Confetti's Garden Bunch set - stamped in Daffodil Delight and Crushed Curry. The sentiment is from RC's A Friend Like You stamp set. I used Leafy Confetti Cuts and die cut the leaves from 3 different shades of green in my scrap pile. 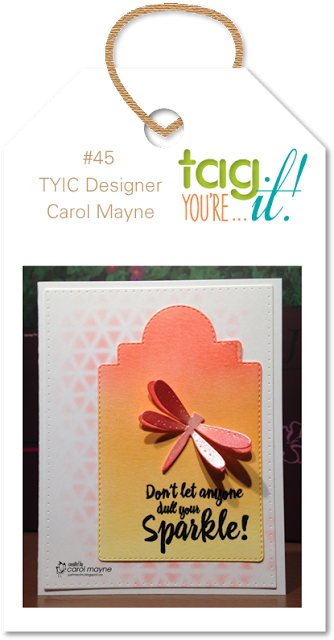 A card really comes together quickly when you have both the layout and the colors spelled out! 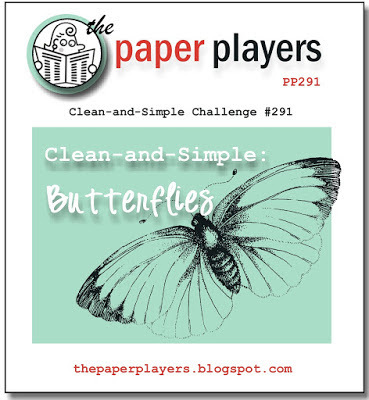 Big congrats to our guest star stamper - Channin Pelletier of Craft Ghetto blog! 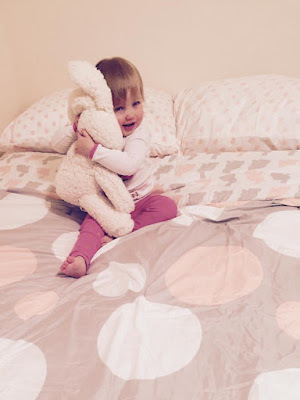 Be sure to stop by her blog and say hello. To get all the details on how to play along, please go to the Color Throwdown blog! You can also check out the rest of the design teams' creations for more inspiration on the CTD blog or you can clink on their blog links below. Maura has chosen a pretty combination for the SCS Color Challenge - Elegant Eggplant, Bermuda Bay, Old Olive - with an optional dessert to use any kind of embossing. 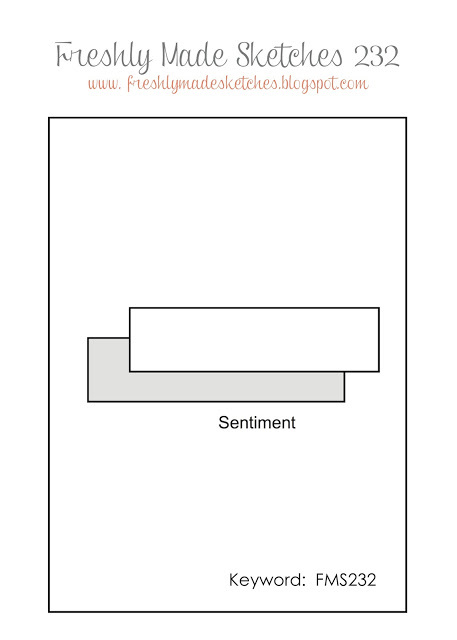 I guess you could call the stitching on the sentiment banner a form of dry embossing. I'm actually CASEing one of my own cards from 9/2014 that you can see HERE. ACCESSORIES: Buttons (SU), Butterfly punch (SU), Stitched Fishtail Flags Die-Namics (MFT), Corner Chomper. 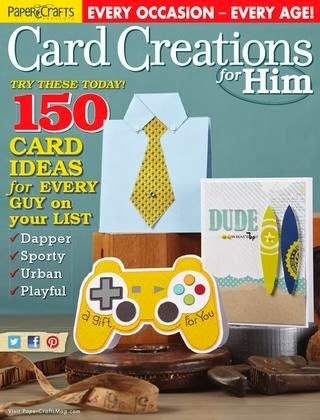 I'm needing a ton of birthday cards this month, so this is one more checked off my list. 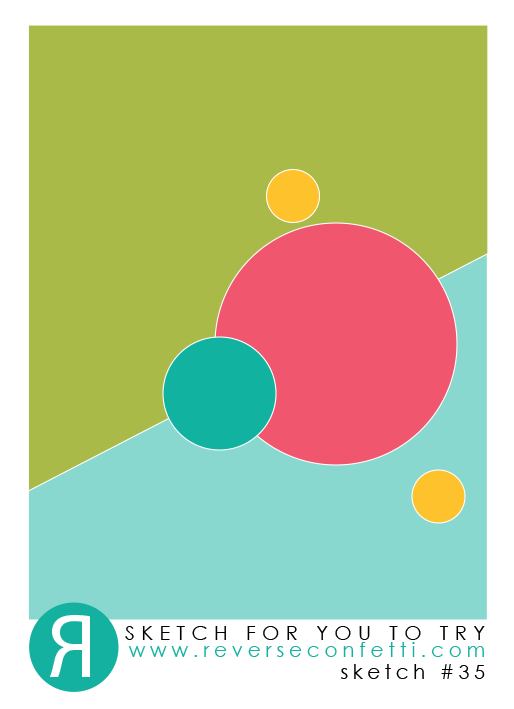 I used the colors in The Challenge #68 - hot pink, green, teal, yellow - and paired it with the layout for the Retrosketches Challenge #210. I stamped a couple of washi tape images in Bermuda Bay ink from SU's Tape It stamp set. The florals are from the Wildflower stamp set by Concord and 9th - stamped in Melon Mambo then fussy cut. Instead of solid coloring, I used a Copic marker (Y06) and stippled the petals. They were then layered with a matching floral die. Leaves were punched using the bird punch by SU. 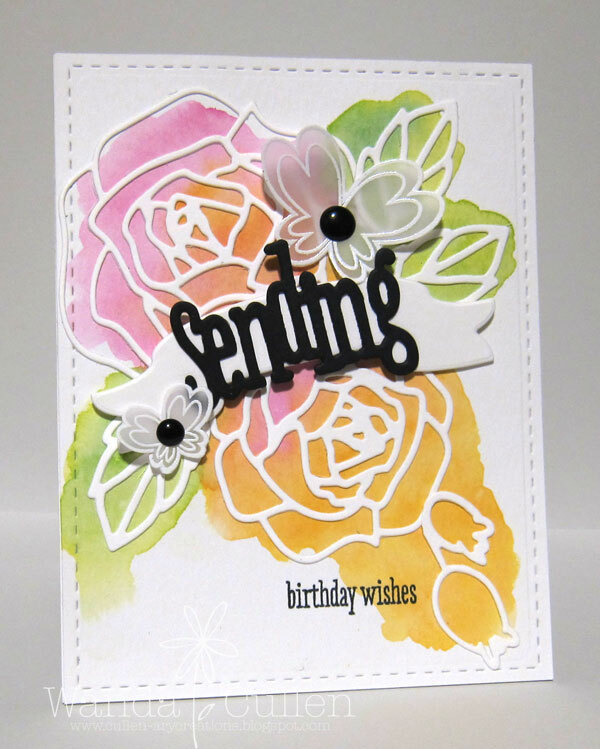 The sentiment was stamped twice using my MISTI and I'm loving the bold font from Altenew's Painted Greetings set. It was then die cut using MFT Die-Namics. Enamel dots were the finishing touch! While creating this card, I was playing a couple of episodes from the Outlander series (season #1)...SO VERY GOOD!! I'm not typically a binge show watcher, but this one has me hooked - lol! Thanks so much for stopping by! Hi and happy Mojo Monday everyone! Julee has a super sketch that was perfect to incorporate some watercoloring in the background. I then took it a step further and watercolored the little birdies. Since I'm in baby mode after hearing there will be two new babies in the Cullen clan this fall, I simply had to go with a baby-themed card! After the Peacock Feathers distress ink dried, I splattered the base with white Heidi Swapp color shine. Next...I dropped the bottle and emptied half of it on my lap...yep...on my favorite black slacks! I did a quick strip down and ran to the laundry room to get them washed in cold water. :-/ I watercolored the wings on a second set of stamped birds, then fussy cut and popped with foam tape. 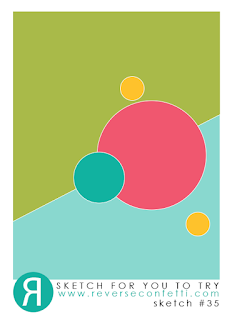 PAPER: Ranger watercolor CS, PTI Tropical Teal and Limeade Ice. ACCESSORIES: Loopy Blooms die by Verve; Diagonal Stripe Pretty Panels Confetti Cuts by Reverse Confetti; Stitched Fishtail Flags STAX Die-Namics by MFT; Stitched square die by Lil' Inker Designs; Enamel dot; Wood veneer stars by Studio Calico. 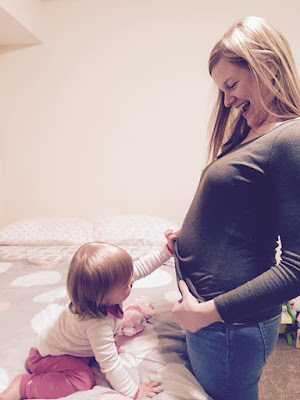 Before I close my post, I wanted to share a couple of photos of Quinn checking out her mommy's belly. She's not understanding it all quite yet, but is loving her big girl bunny bed in the meantime! Her brother is due to arrive August 5. I'm heading out (this was pre-posted on Friday evening) to eat with our daughter and son, DIL and Quinn at an Asian fusion restaurant that serves Thai, Chinese and Japanese foods. Yummmm!! My DH is not a fan, so while he's out of town for the w/e, we will enjoy. Hope to see you in the Mojo Monday gallery!